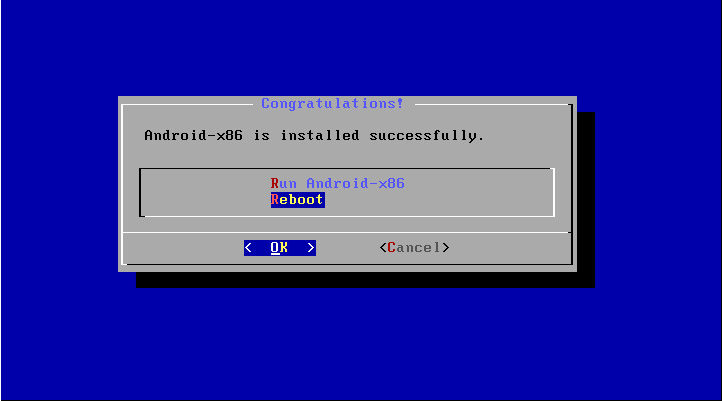 I don’t know why, but installing Android x86 6.0 and 7.0 on VMWare ESXi is not quite simple as it should be. 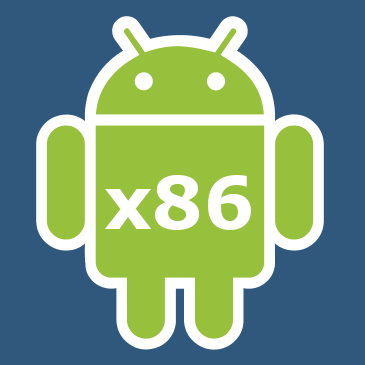 First, download Android x86 6.0 ISO from official download page. And don’t forget to upload it on your datastore. 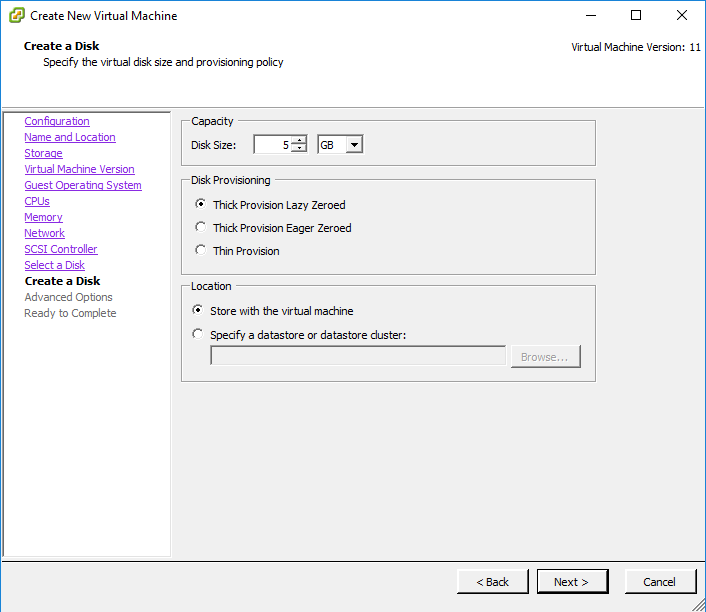 Check “Edit the virtual machine settings before completion” checkbox and click “Continue” button. 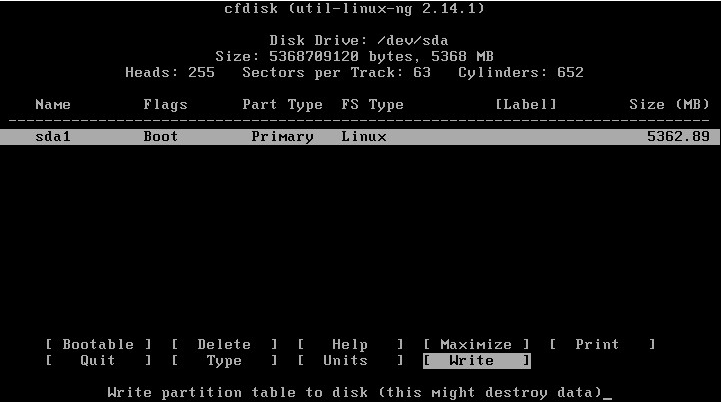 Edit virtual CD/DVD drive. 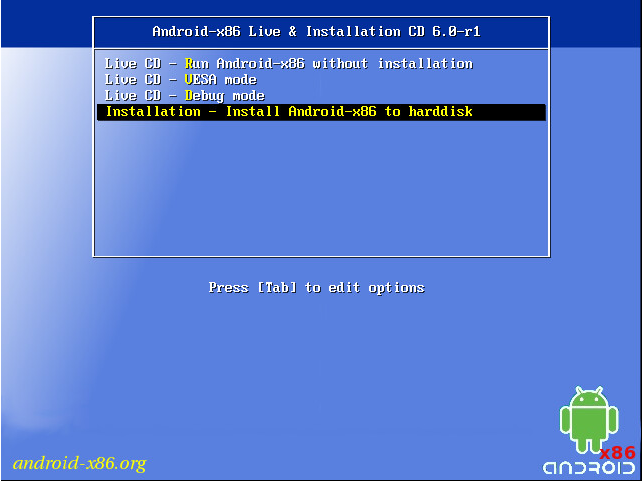 Choose your Android x86 6.0 ISO as Datastore ISO File. 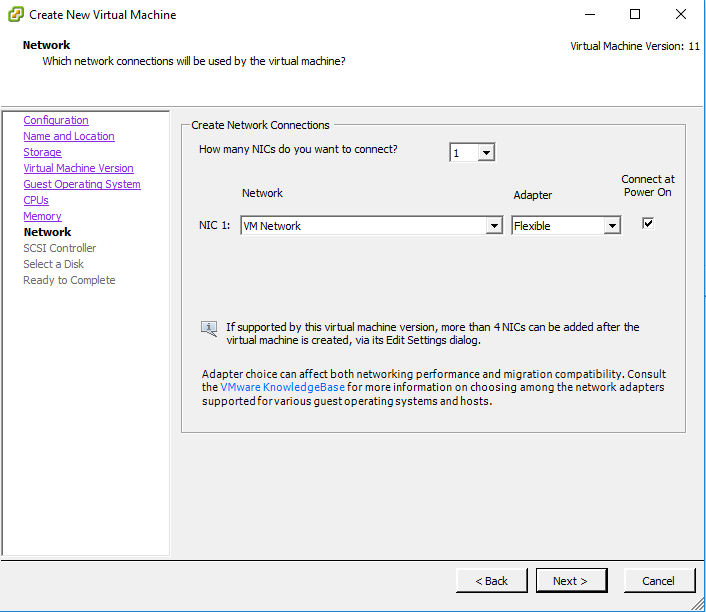 Check “Connect at power on” checkbox. 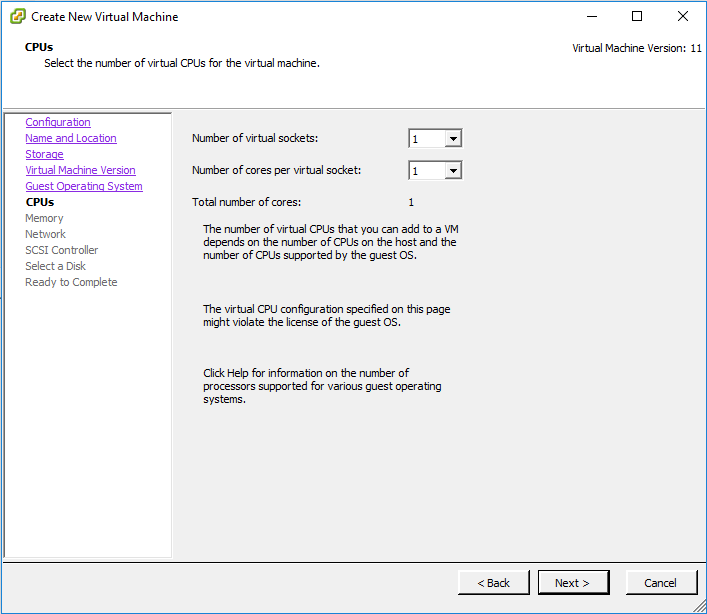 Start virtual machine and choose ordinary installation. 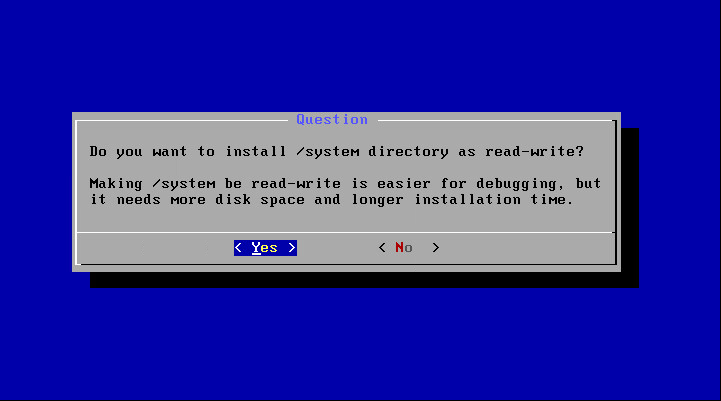 I prefer install /system directory as read-write, because it’s a developing machine. You may leave “quiet” parameter as is, but I prefer onscreen logs when system loads, so I delete it. What you should really do is to place “nomodeset xforcevesa” parameters as showing on screenshot and press Enter. Android welcome settings are trivial and are the same as on any other phone or tablet, so I leave this section without detailed screenshots. 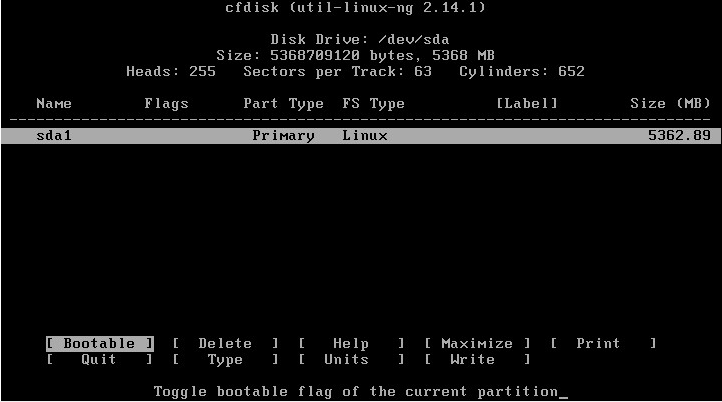 Now mount sda1 block device and change GRUB menu. 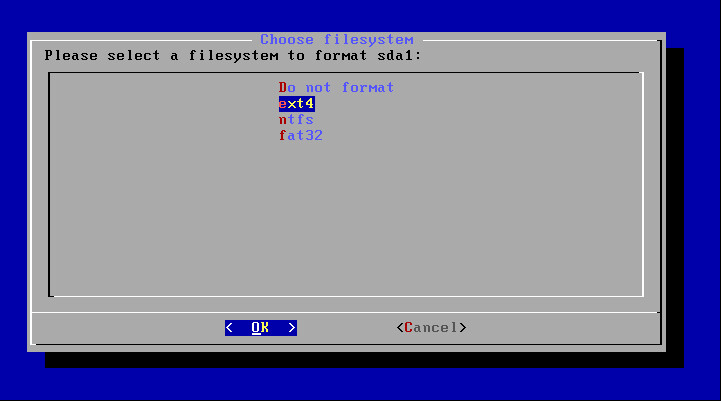 On vi press “i” to enable edit mode. Then add “nomodeset xforcevesa” parameters to first menu row. Press Esc to exit edit mode. Then type “:w” and press Enter to write changes and type “:q” and press Enter to quit. That’s all! 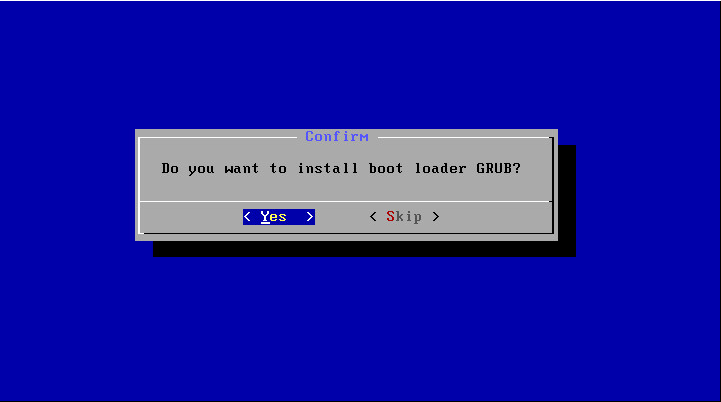 Type “reboot” and press Enter on Android console to check that GRUB changed and Android loads. To enable developer mode, go to Android settings menu -> About tablet. Hit “Build number” 7 times. To disable device sleeping, go back to settings menu -> Developer options. Enable “Stay awake” option. 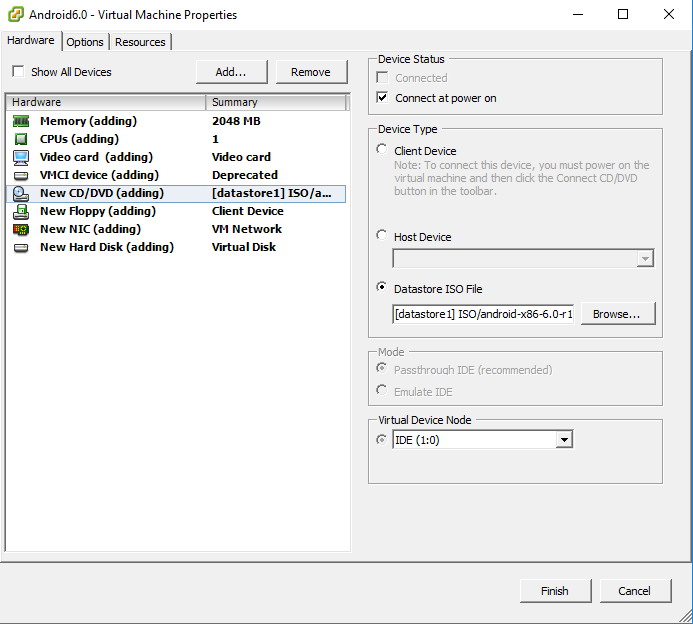 If you are want to use VM for developing, it will be usefull to enable “USB Debugging” option and disable “Verify apps over USB” option. 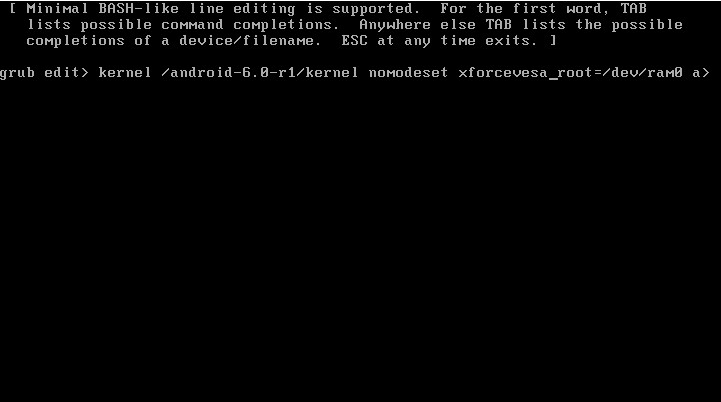 To find your Android IP address, go to Android console(Alt+F1) and use “ifconfig” command. To go back use Alt+F7. Finally! The only guide that actually gets this to work! There are so many rubbish guides out there that tell you all the wrong things on very old versions of Android with recent versions of VMWare. Great help for me. Never managed to identify this “nomodeset xforcevesa” option. Thanks man, this is the only guide that actually provides useful information. Think I saw something like this before. 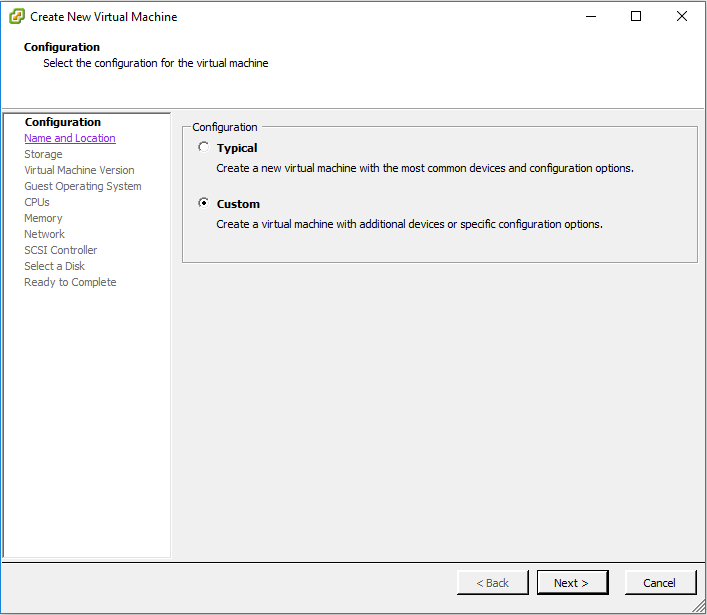 It may be about VM mouse integration, but I can’t find how to disable it now. Did anyone find how to get the mouse working? 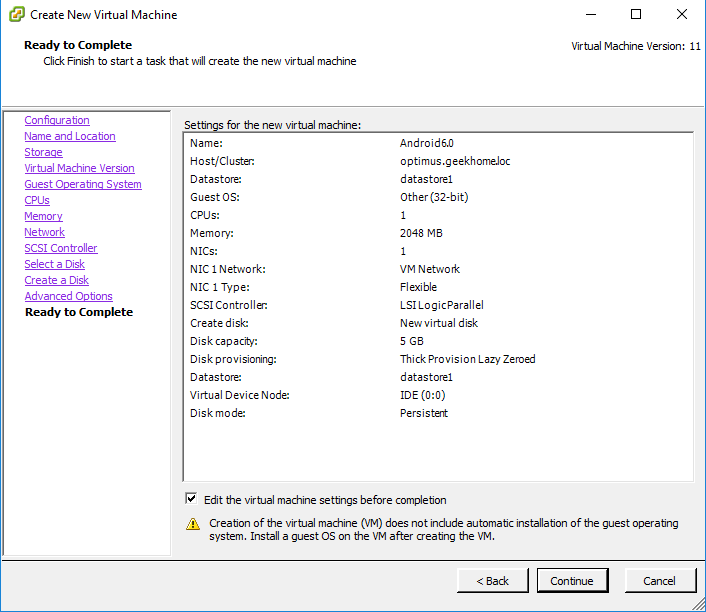 Side note: if you select the VM type as “Windows” you can enable 3D Graphics support in the VM settings which negates the need to modify Grub. 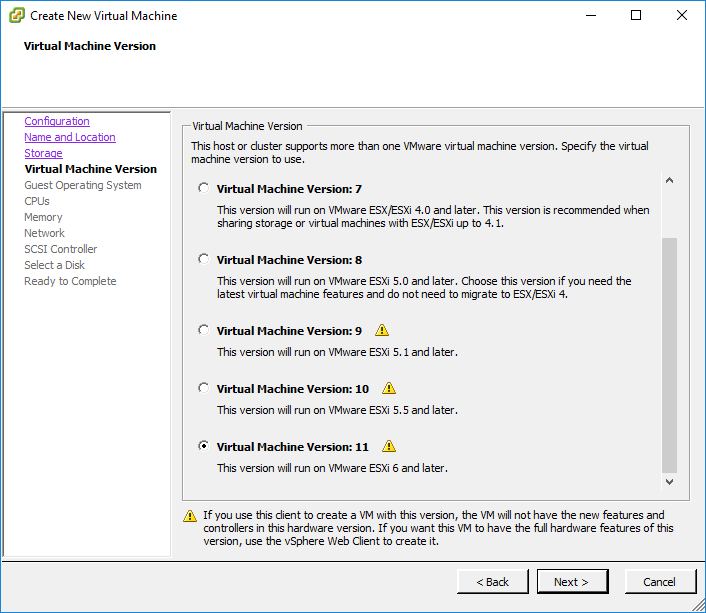 So it occurs to me that the screenshots are using vSphere client, which is only compatible with ESXi 6.0 and earlier. If all of us with the mouse problem are using ESXi 6.5 that may be the problem. 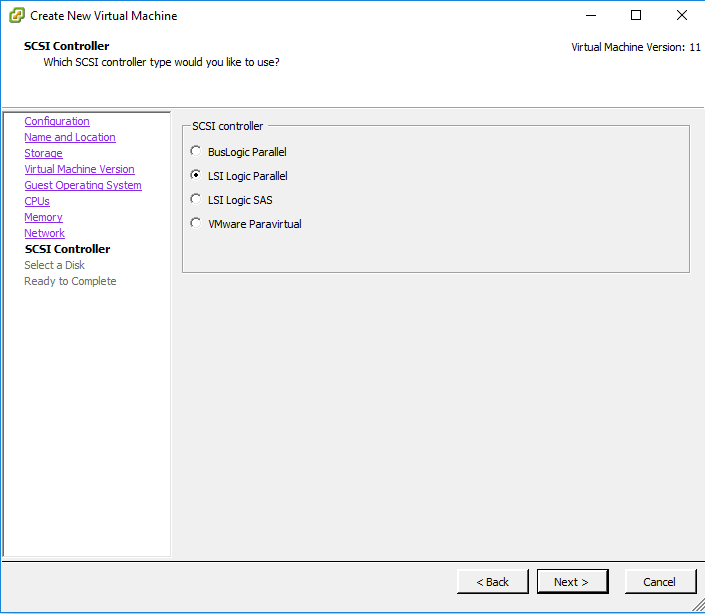 I know the mouse doesn’t work in the web client nor does it work in the VM Remote Console for ESXi 6.5.
vSphere client won’t connect to an ESXi 6.5 server. 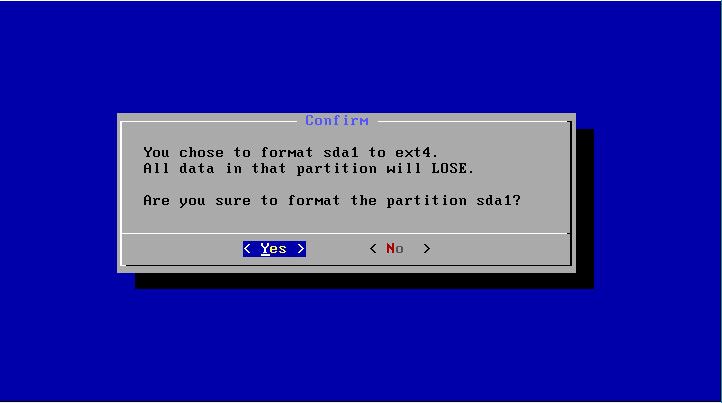 I may try rolling an ESXi 6.0 server to see how it goes. It’s a little laggy but these appear to be the conditions under which the mouse will work. 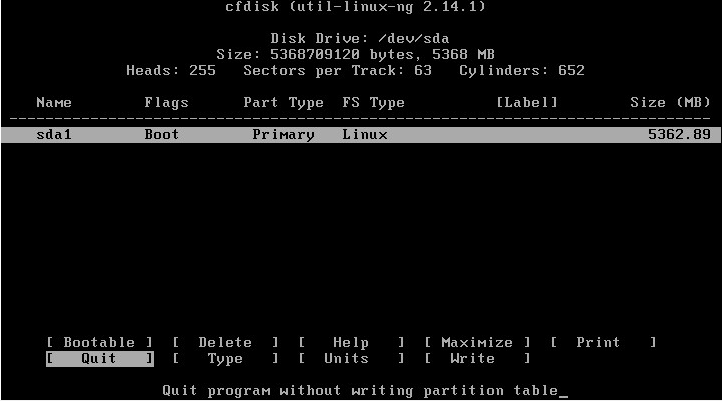 Furthermore, in 6.5 enabling 3D graphics support works and negates the need for modifying Grub, this does NOT work in 6.0. 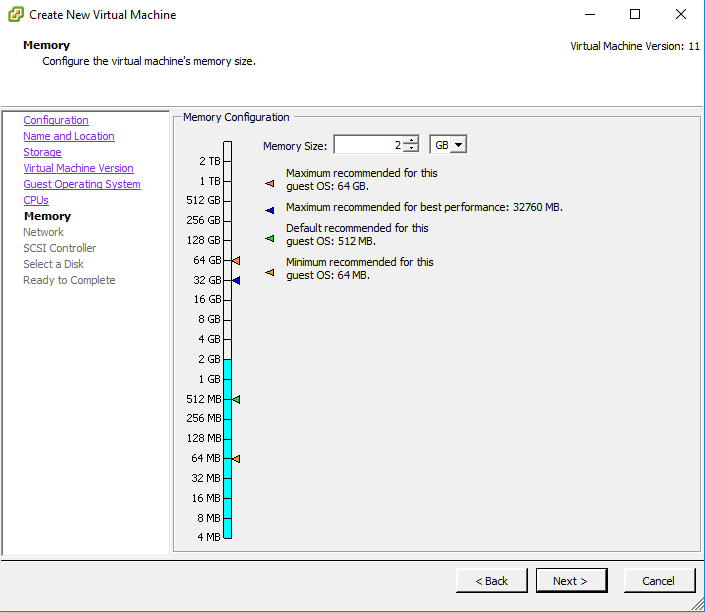 Enabling 3D graphics causes the VM to hang at a black screen. I suspect this is related to hardware rendering support and 6.5 has a better driver for my hardware. Now to figure out how to get wireless working. ESXi won’t pass through my wireless adapter so I think the best solution will end up being trying to talk the Android-x86 developers into doing some sort of virtual wireless bridge. Disregard. 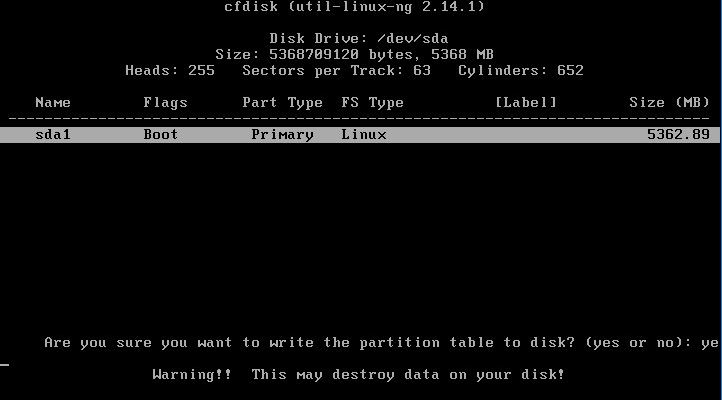 I screwed up the partition. Re-partitioned and now it’s good. let’s say 1200*800 or maybe the other way around 800*1200 ? I followed your tutorial and everything runs perfectl, but I can’t get any network connection. I need to setup a static ip for Android x86 on ESXi. Then I try to ping 8.8.8.8 for example (or any IP on my network), but it fails with no connection. I have not encountered this issue before. 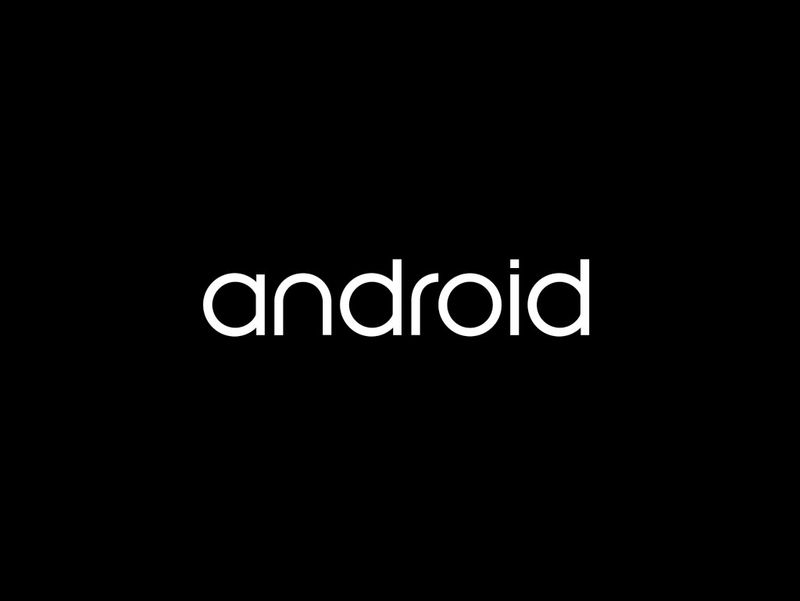 All android systems I have, got their IP successfully via standard VMWare virtual network adapter. Maybe it’s not an Android issue, but network issue? On my local network I don’t use DHCP and I must have it that way. 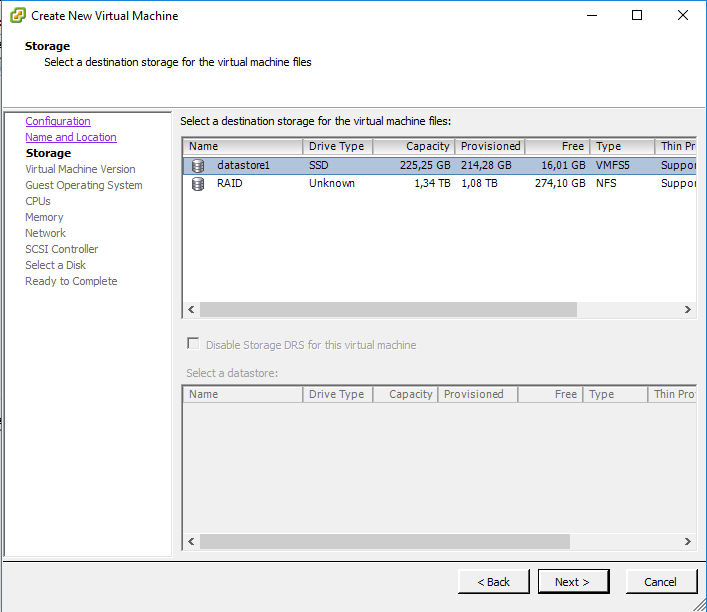 All VM’s within ESXi (Windows, linux, etc) have static address and they are working great. 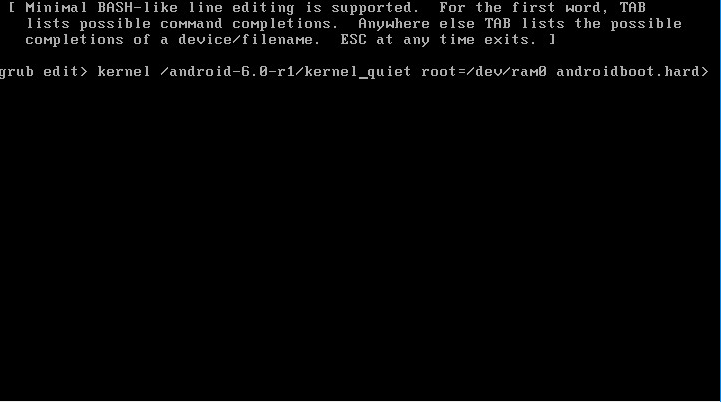 that states as key feature for Android-x86 7.1-rc1 the “Ethernet (DHCP only)” feature. With this in mind (and I hope someone could prove me wrong) I believe ethernet (and internet) is not avaliable if a DHCP server is not present on the network. At the last screenshoot, after edit the line with “nomodeset xforcevesa”, then pressed “Esc” to exit edit mode, ok. But stayed at the same place. So, where I am supposed to type “:w” and “:q” ??? No problem. Vi is an old text editor and not so obvious for modern users (for me too 🙂 ). Vi has two working mods: edit and command. When you pressing Esc you are exiting edit mode and entering command mode. From this time you are able to write commands “:w” and “:q”. You will see them at the bottom of the screen. It’s important to begin them from “:”, otherwise they will not appears. Don’t forget to press Enter after each of them. DUDE. Genius! Thank you. Seriously. This is fantastic! The host machine is admittedly not what I’d call beefy, but could that be an issue? FWIW, it’s an HP N40L Microserver with 10GB RAM. 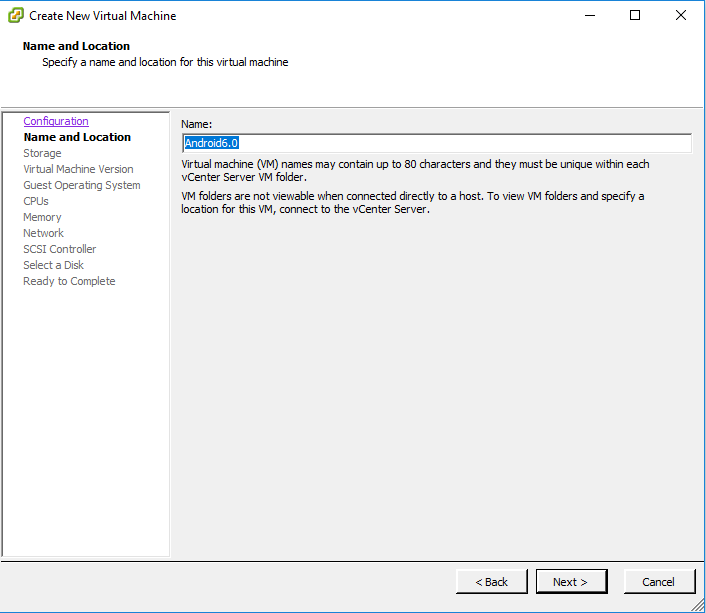 It is also running 2 other VMs (WIn2012 server as DNS and Untangle NG firewall). Would appreciate any insights. Never seen such freezes before, so I can only guess, sorry. 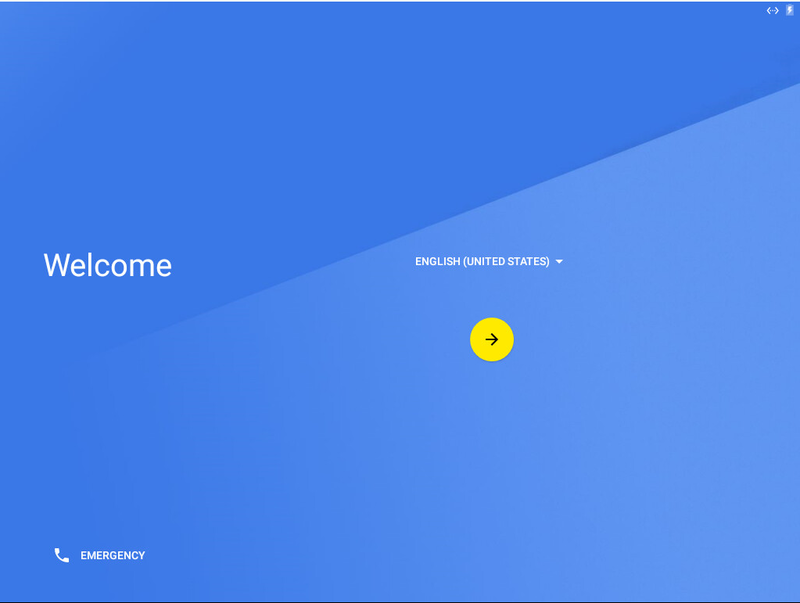 First, I would try another build, or maybe Android version. 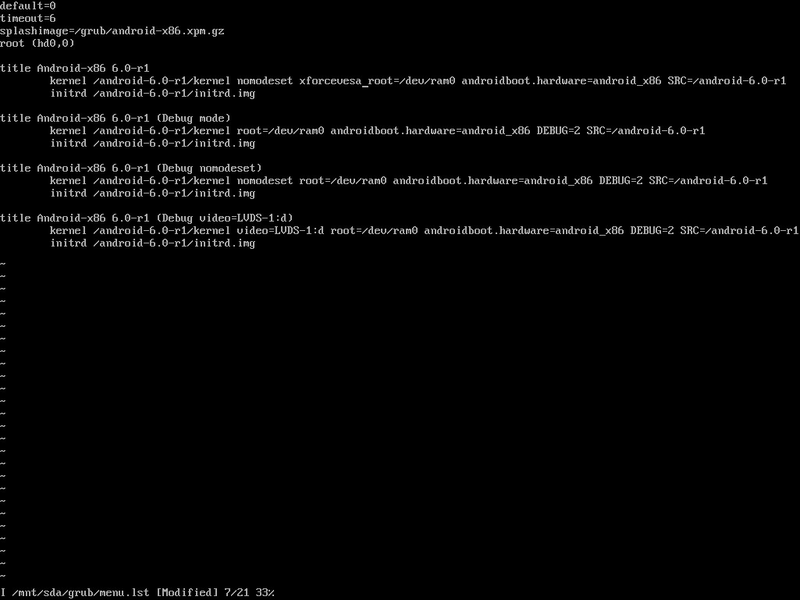 Second, I would look at both Android and ESXi logs. 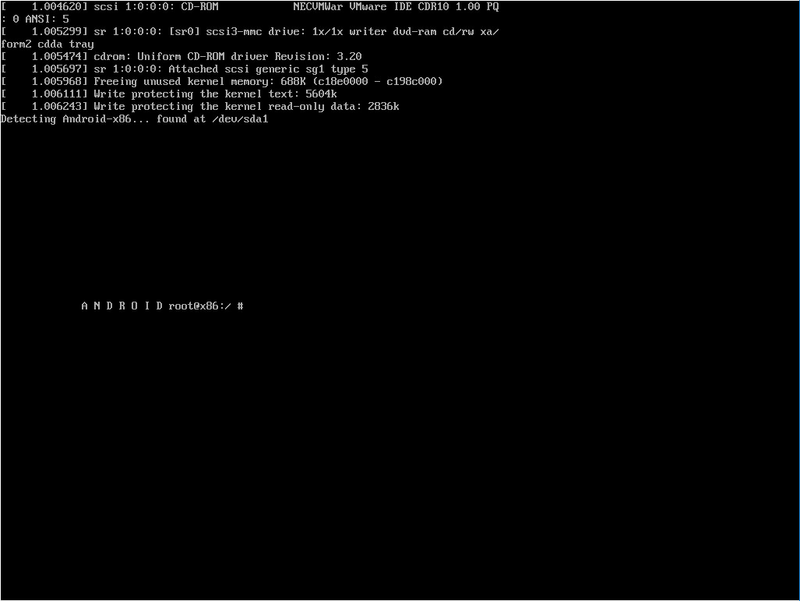 Anyway, I don’t know is HP N40L Microserver hardware officially supported by VmWare. 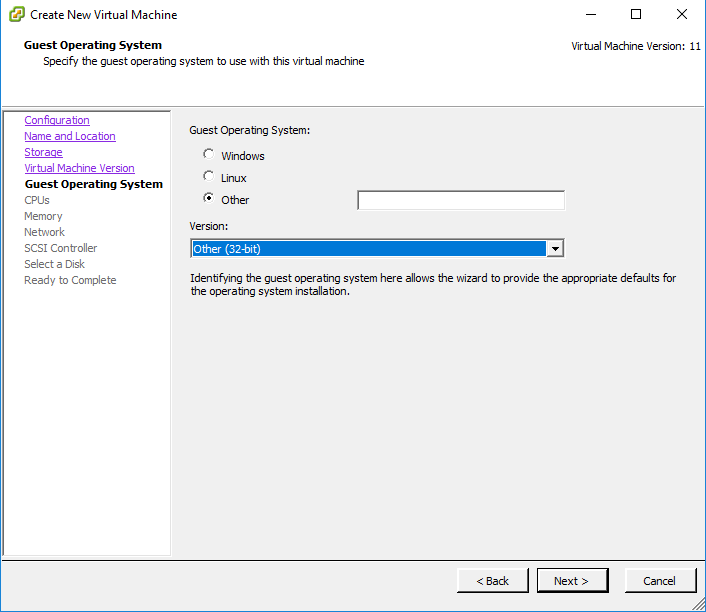 It should not be an issue since it already works, but some ESXi versions may conflict with some guest OS versions in rare cases. 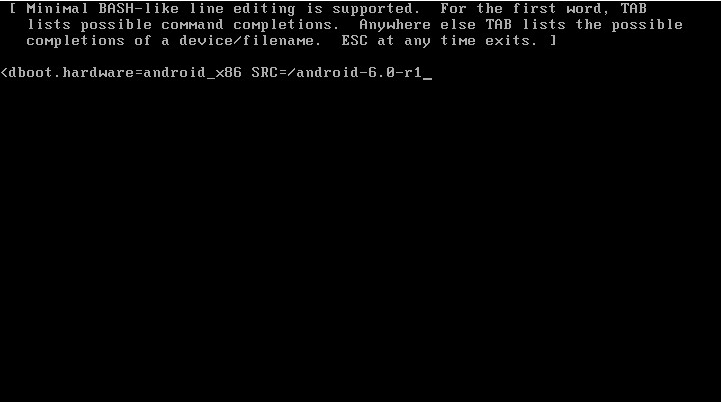 Using Android x86 7.1, on ESXi 6.5, I follow the instructions, but get no GUI at all. Have tried “vga=ask” and tried several graphics modes, all fail. Any ideas? i met the same problem, and it was resovled. 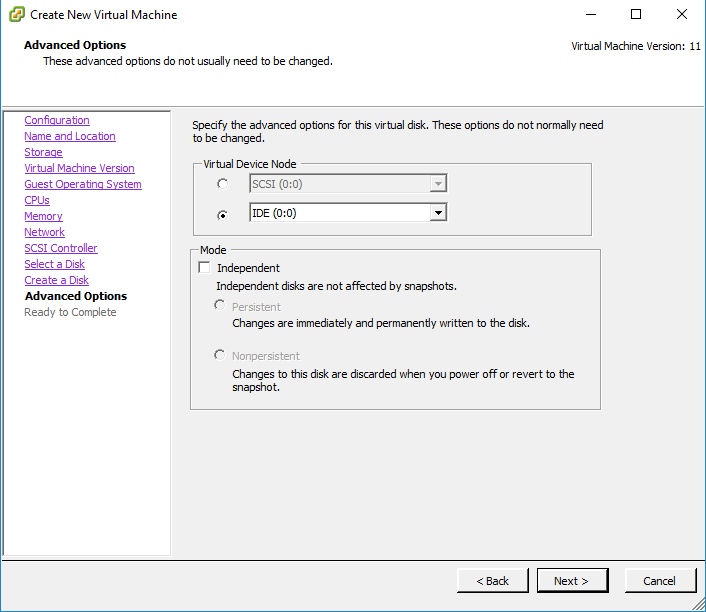 (2)in setting dialog of vm, enable the 3D function of the display. 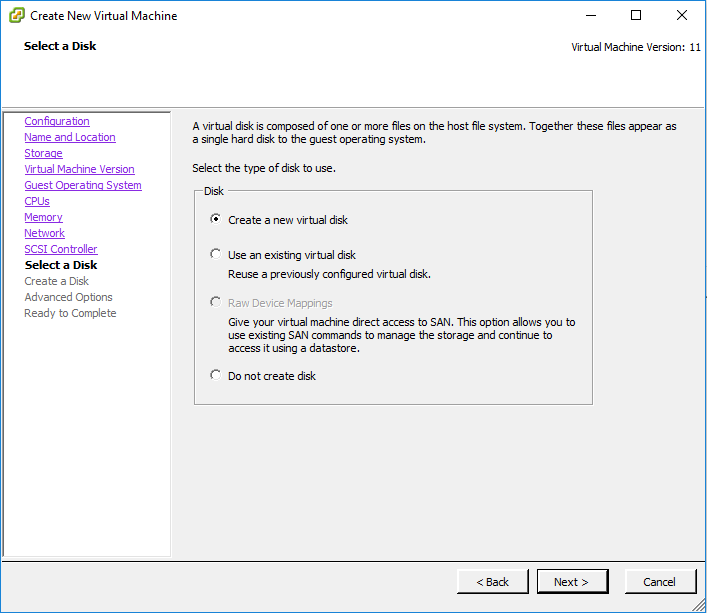 is it work with esxi 5.5? 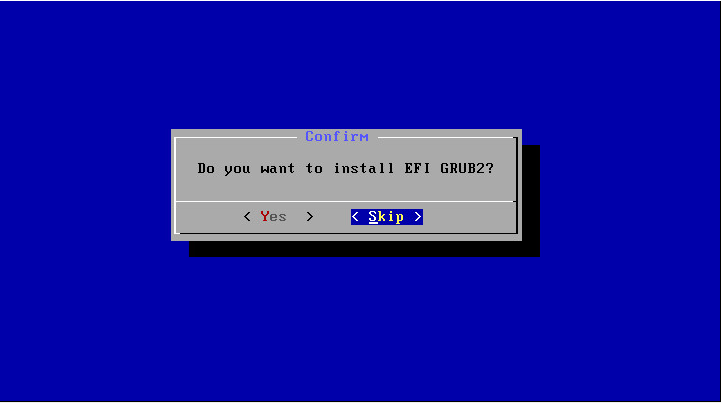 is it install on ESXi 5.5? Do you have any idea on how to resolve it? Excellent guide. It contains all of the things I learned the hard way but still showed me how to edit the grub menu on a standalone install. Well done! I have a problem with internet network. I need the static io because i have exsi on dedicated server. Ant idea?